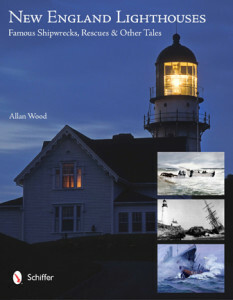 Where lighthouses were built on specific locations as navigational guides, to aid mariners in distress, or assist mariners in inclement weather, lightships were needed in the late 1800s as mobile floating lighthouses at dangerous locations, or within busy shipping channels where it was not possible to build a lighthouse. The crews of these relatively small vessels would endure extremely cramped and lonely conditions away from the mainland, along with extreme weather conditions in fog, violent storms, hurricane force winds, swelling seas, and natural formations like ice floes that could rip the hull of a ship. If a storm approached and vessels were trying to seek safety in nearby harbors (or even in clear weather), lightships would remain at anchor at their designated stations during the storm and provide the flashing light or sound their fog horn to help each vessel navigate to safety. In the 1930s, radio was used where the lightship was anchored at a designated coordinate. The ship would flash their light beacon at night and bounce the radio signal across the waves. The trans-Atlantic vessel, whether entering or leaving their destination, say a harbor, would steer towards the signals of the radio beacon or flashing light directly in the path of the guiding lightship. There was a lookout posted on the incoming vessel whose purpose was to locate the lightship from the signals received and adjust the ship’s course to avoid collision with the stationary lightship. The lightship, anchored in its position was quite vulnerable in that it could easily be involved in a direct collision with a misguided vessel. Those crewmembers that were stationed aboard lightships knew they were in the most hazardous and vulnerable position, as many lightships met with tragedy in colliding with ships. For crewmembers of lightships, it was extremely physically trying and emotionally difficult. These men were known as sailors who never went to sea and little of their existence was brought to public understanding unless tragedy or severe sickness became their fate. Many lightships were stationed just off shore where they could not participate in life on land but could hear society at work and at play. They would be moored over treacherous reefs, or would mark the narrow entrance to a channel or harbor. They would be stationed on board ship at least 3 out of 4 weeks each month, and with weather permitting, would be given shore leave for up to ten days. The most popular man would be the one coming back onto the lightship from the mainland with the latest newspaper for the crew to receive the most recent news. 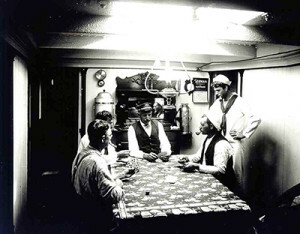 Regulations would not permit visitors, especially family members of the crew to board the ship, as these families had to endure long periods of absence from their loved ones. 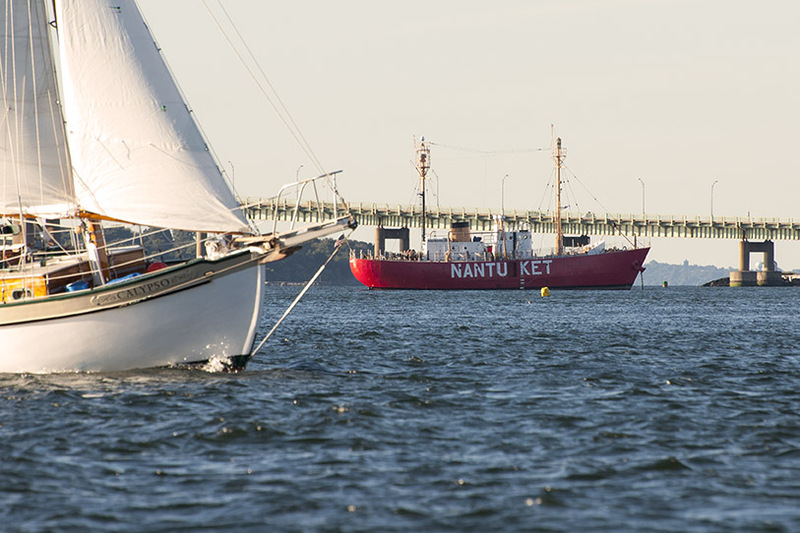 During the grueling winter months, frequent nor’easters would pound the coastline and violently toss the exposed lightships, making even the most seasoned crewmembers seasick. There was also the constant ear deafening sounds of the ship’s fog signals and nauseating diesel fumes to make the experience even more uncomfortable. Working on a lightship was known as the most hazardous profession in the marine service. New England had its share of accidents and tragedy. To make matters worse, the early lightships of the late 1800s and early 1900s were usually in deteriorating conditions from lack of funding by the government. One of the worst tragedies in lightship history involved the Nantucket Lightship LV-117. The 130-foot Lightship LV-117 was built in 1930 and went into service in 1931 as the largest lightship ever built. It carried the most modern signaling equipment of the time. On May 15, 1934, with heavy fog, the RMS Olympic collided with the lightship, cutting it in half. Seven of the eleven lightship crewmen drowned in the chilly waters and four were rescued. 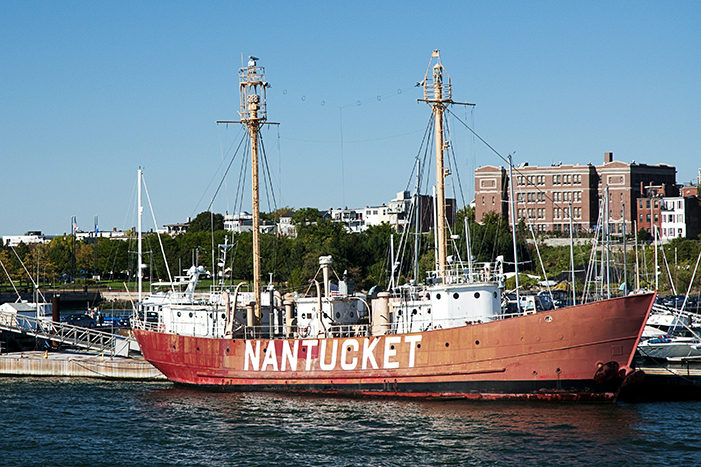 A replica of the lightship the Nantucket LV-112, was built and became the longest serving lightship until she was decommissioned in 1975. 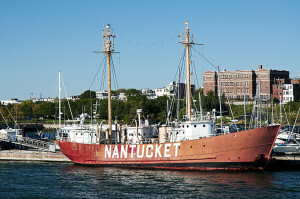 With the necessary funding provided over the years, the Nantucket LV 112 remains as the floating United States Lightship Museum and has been docked in East Boston at the East Boston Shipyard and Marina since 2009. She serves as a proud testament to the men who served in the most perilous Naval position.